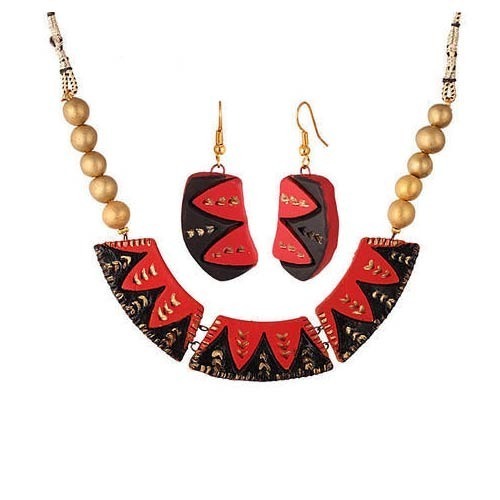 Unique red and black combination necklace with dropper. Terramart is an Organisation Deals with All kind of Jewellery & Clothing with the High Quality. is the destination for online shopping of Best Collection of All kind of Jewellery, Accessories & Clothing. We assure you the Best Quality Product with affordable prices, as we believe in 100% Customer Satisfaction. Our Motive is to provide you the Best Collection.
" Terramart Bhoomi" is a Brand Name for Hand Made Jewellery. "Terramart" is a Brand Name for Fashion Jewellery & Clothing.